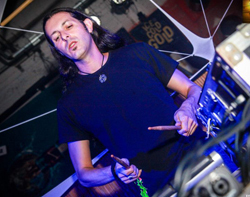 Minimal Criminal is a Psygressive Trance project from Brazil currently based in Israel. Valerio Zhyin and Bruno Echoes started the project in 2004 in Rio de Janeiro. In 2007 Valerio moved out of Brazil. For years , Bruno and Valerio performed as Minimal Criminal separately and would occasionally collaborate on a track together. Internal conflicts eventually grew and caused a split between the two members. As of 2014 the official Minimal Criminal is Valerio Zhyin. Minimal Criminal have performed at parties and festivals around the world. Valerio performs unique live sets with the alien costume, live MIDI drumming, vocals, and theremin. Their full length album, "Minimus Maleficarum" , was released in November 2010 through Cosmic Conspiracy records. After that, various tracks have been released in a variety of compilations by labels such as Zenon, Halu Beats, Biosine, Vagalume, Planet B.E.N., Phantasm, Ovnimoon, Plusquam, Glitchy Tonic, Uroboros, and others. In 2016, a second full-length album, Valerian Tales and the Zeuhllander EP, was released by Quantum Digits Recordings. In 2017, another full-length album, Alien Anthology, was released by Soulectro Music. Created by Elune Art. Copyright@2018 by Zhyin. All rights reserved.